ENDA KENNY HAS said that he takes full responsibility and the blame for the John McNulty controversy. The Taoiseach’s comments were made to RTÉ while canvassing in the Roscomon South Leitrim by-election and are an attempt to draw a line under the controversy. It comes at the end of a week that has seen Fine Gael widely criticised for its handling of McNulty’s nomination to the Seanad. It emerged that the Donegal-based shop owner was nominated to the board of the Irish Museum of Modern Art (IMMA) just days before he was picked as Fine Gael’s nominee for the Seanad by-election leading to accusations of a ‘political stroke’ being pulled. The Taoiseach has also insisted that the Arts Minister Heather Humphreys is not to blame for what had happened despite her having appointed McNulty to the board of IMMA. However, Fianna Fáil leader Micheál Martin has asked “what exactly is he apologising for” and called on the Taoiseach to make a statement in the Dáil. “Is the Taoiseach now admitting that he instructed Minister Heather Humphreys to appoint Mr McNulty in support of his Seanad candidacy?” asked Martin in a statement this evening. “This goes to the heart of the scandal and requires a full statement in Dáil Éireann from the Taoiseach outlining the entire sequence of events from the beginning to the end of this shabby affair. McNulty resigned from the IMMA yesterday citing its internal rules which he said precluded him from serving on the state board whilst running for election. McNulty’s name appears along with two others – independent Gerard Craughwell and Sinn Féin’s Catherine Seeley – on ballot papers that have gone to TDs and Senators today. Kenny said this evening the legal advice is that the by-election process cannot be stopped. A result in the by-election, which McNulty will almost certainly win with the support of Fine Gael and Labour Oireachtas members, is expected on 10 October. Email “'Not my finest hour': Enda Kenny says he takes all the blame for McNulty-gate”. 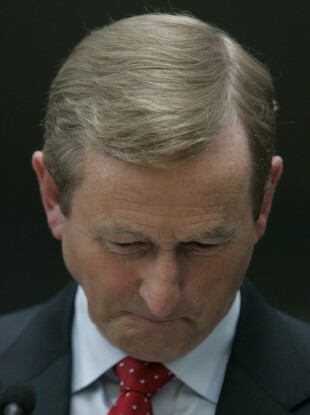 Feedback on “'Not my finest hour': Enda Kenny says he takes all the blame for McNulty-gate”.